Q & A session with TOKYO GHOUL Senior Editor, Joel Enos! In an effort to boost interest in Tokyo Ghoul, Viz Media and Joel Enos were kind enough to give The Outerhaven a few moments to answer a few questions that we figure many followers of the series are asking. It also gives an opportunity for readers of translated manga to get into the editor’s head to see the thought process behind the slightly different versions intended for different audiences. Q: What about TOKYO GHOUL specifically interests you the most? A: Monsters. Of any sort. When it’s done well I’m a huge monster buff. I hesitate to say I like Horror because slasher and things that can really happen are way too scary for me. But monsters I can handle. Also, the whole teen angst high school slant. There’s a theme of fitting in, feeling different, peer pressure (from other teen monsters or teens who can turn you into monsters) that I think is really well done in this story. Those years are so formative, even if they are often things we try to forget later. But we learn a lot from them and usually they are hard lessons and I think Tokyo Ghoul has an undertone of acknowledging that. Q: As an editor, sometimes the source material makes a cultural reference that may feel out of place for English readers. Is there any of this in TOKYO GHOUL and if so how is that handled? Do you keep it in or do you find it is sometimes better to alter it so that readers can relate more? A: Well, it all takes place based in Tokyo. So from the beginning it’s manga from Japan happening in Tokyo. But I think that’s more of a draw for English readers now more than anything. We’ve crossed an international cultural divide in literature and art that I think is important to point out. We are all much more comfortable reading about people who don’t live the way we do — and finding the universality in those stories. I don’t change very much anymore in manga that I edit unless it’s humor that needs a tweak just due to English readers maybe not knowing the basis for a joke. But I tend to avoid that as well if I can. 3. Q: Do you feel pressure to match the same tone and feeling set by the Japanese author? A: 100%. This is the creator’s work. It already exists. It’s already awesome. My job and the job of my staff, the writer, the letterer, the designer, is to make sure this book comes across for an English speaking audience just the way the creator intended — to the best of our ability. I approach it the same way I would for an original U.S. work. I can flag things or ask questions with an English speaking writer, even point out what may not be working or what could potentially be misinterpreted by some readers. But in the end, if I’m editing, the story is the writer’s, not mine. It needs to be their voice. Q: How many manga titles in this horror genre have you worked on? Do you use those experiences to build upon new projects such as the current release of TOKYO GHOUL? Did you look to the anime counterpart at all for guidance? A: I have worked on quite a few things that have helped shape how I approach editing TOKYO GHOUL…some less horror than others, I’m a big fan of dystopian futures as well. And subtly supernatural or science fiction stories with a scary vibe. I’ve worked on manga that fits into that from Kaori Yuki (The Earl Cain Saga, GODCHILD and to some extent I guess FAIRY CUBE had elements of horror in it), PSYREN from Toshiaki Iwashiro is more Shonen but it has the monsters, Aya Kanno’s BLANK SLATE is bleak and takes place in an alternative modern setting, so less horror but I’d say that also had an influence in how I read or edit suspenseful horror manga. I read a lot of scary non-manga too. Richard Matheson, William Hope Hodgson, Shirley Jackson. And movies and the current horror crop on TV of course. American Horror Story. The TV adaptation of Blake Crouch’s Wayward Pines. I’d even say Fringe was one of the best “scary” serialized shows on TV in recent years, especially the later seasons. The anime is something I always pay attention to when editing manga. And with NARUTO, I worked on the actual scripts for the show at the same time I was editing and adapting the manga. I think it’s important for fans to see a consistency across the entire world between what they watch, what they read, what they play, like in video games. Fans can see when we haven’t paid attention to consistency…we owe it to them to try our best. But I don’t copy the anime. I just make sure I’m aware of it enough to inform my decisions when things come up. 5. 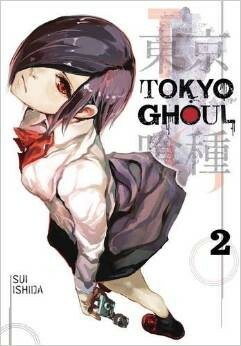 Q: In regards to TOKYO GHOUL, there is a sequel currently being published called TOKYO GHOUL:RE in Japan. Are there any plans you can speak on to bring that to America through VIZ Media? A: Right now we are concentrating on getting the original series released in English as best we can. We’ll have to revisit this question at another time in some alternate universe! The Outerhaven would like to thank VIZ Media and Joel Enos for answering our questions!